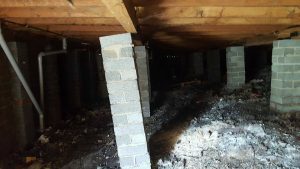 www.hobartbuildinginspection.com.au There are so many houses around Hobart where the owner has undermined the structural integrity of their property by digging out under the floor the get extra room. I looked at a place yesterday and the pier foundations were totally uncovered with no ground support around them just floating on top of the ground as a result the house had developed major cracking in brick work and some of the rooms were like walking on a trampoline. If you're going to dig out for extra room, seek out a good engineer first before you do anything.